I’ve had varying experiences of STRAYA Day. In Melbourne, I mainly ignored it other than as a signal for the appropriate day to mark Triple J Hottest 100 Day, a far more worthwhile ritual. In my later years in Melbourne, that land of wanker-parochialism, I found it increasingly worrisome. Angry bogans with Southern Cross tattoos and Australian flags wielding their national symbols as nationalist, white supremacist icons. Unsurprising, I suppose, given that it’s Invasion Day, the landing of the First Fleet in Botany Bay. In Sydney, however I’ve found it far more welcoming. Seen people from all ethnic backgrounds happily enjoying the holiday. People greeting me to say “happy Australia Day”. 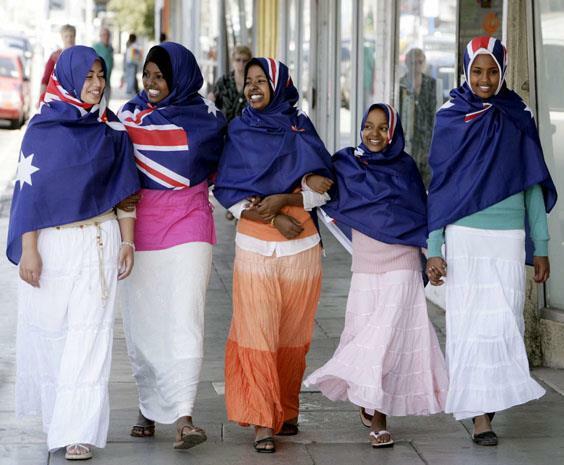 Ironically, but awesomely, this photo is from the suburbs of Melbourne; a young Somali-Australian lady and her friends wearing hijabs of the Australian flag designed for Harmony Day but shared by a Melbourne creative arts centre, Artplay. Of course, no Jaguar Python post would be complete without something utterly negative. So here it is. Unfortunately, a lady who I happen to temporarily share a house with has the most atrocious taste in humour. And there is a television in this house. Which means that I had to endure “Miss Congeniality” and thus Sandra Bullock’s snorts alternating with my temporary housemate’s raucous tittering, advertisements featuring Lambast-ador Sam Kekovich (another Australian non-celebrity) claiming that not eating lamb is “un-Australian” (bogan for “probably a good thing”) and the horror known as the Channel 10 Australia Day Showdown. What is this “showdown” monstrosity? Well, it’s bankrolled by the meat industry and billed as some sort of “comedy debate” about “whether it’s possible to be too STRAYAN” devised by the same “geniuses” in charge of that “cutting-edge” panel show “The Project”. In the 10 minutes I spent subjected to this tripe, I managed to experience a “comedian” Sheila give a cringe-worthy diatribe featuring some True Blue Aussie stereotypes, but not in a funny, ironic or particularly insightful manner. Next in the cringe-carnival was the EMCEE (a The Project genius?) introducing the next mass-debater as “our TOKEN display of TOKENISM featuring a TOKEN ETHNIC ARAB” or something along those lines. I kid you not. The TOKEN ETHNIC then caused further reflexive cringing by joking about how STRAYA was Awesome because the closest we’d come to a Civil War was … The Cronulla Riots! No, not the Eureka Stockade or those weirdos in WA who keep “seceding” as “principalities”. The Cronulla Riots. Totally awesome.